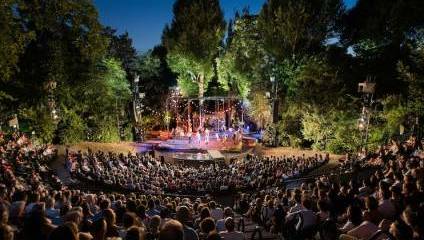 Set within the beautiful surroundings of a Royal Park, Regent’s Park Open Air Theatre was established in 1932 and is now one of the capital’s leading producing houses. With both stage and auditorium uncovered, weather adds a thrilling dimension to their bold and dynamic productions; productions which truly stimulate the senses. The 2019 summer season plays from 16 May, and opens with Thornton Wilder’s Pulitzer Prize-winning play Our Town. As day breaks on another ordinary day, the townsfolk of Grover's Corners go about their business: newspapers are delivered; people go to work; gardens are tended to. And a boy and girl fall in love. But as life's events unfold and a community comes together, one question remains: "do any human beings ever realise life as they live it? Every, every minute?" The season continues with Shakespeare’s A Midsummer Night’s Dream (suitable for ages 12+), Tim Rice and Andrew Lloyd Webber’s hit musical Evita and, in a co-production with English National Opera, Engelbert Humperdinck’s opera Hansel and Gretel. And why not complete your Open Air Theatre experience by purchasing pre-theatre food and drink packages in advance? Options include picnics, a gin experience for two or covered dining with waiter service.